cuisines. Industry professionals acknowledge that while fundamental skills are still most critical, it is important for culinary students to have exposure to a wide range of cultural, sociological, and geographical information because the marketplace is demanding it. Due to changing demographics and evolving tastes of consumers, restaurateurs are under increasing pressure to offer more diverse and/or creative menus. Culinary students who have had a broader exposure to a variety of international cuisines will be more versatile and creative culinarians. We believe students who develop a good palate, expand their range of taste, and develop the techniques gain a better understanding of the culinary arts. The intent of International Cuisine is to serve as a window for students to explore the different cultures and cuisines of the world. Culinary programs have always taught some type of international cuisine course, but while there are numerous good books centered onaparticular country (such as Italy) or region (such as Latin America), there has been no one book that adequately brings together the world’s regions. International Cuisine does just that, teaching the wide range of regions around the world andhowhistory,geography, and religion—not to mention the ingredients—influence the different cuisines. International Cuisine is unique. Many of a cuisine’s culinary traits result from conditions that naturally exist in the region or country—factors such as geography, climate, agriculture, as well as historical, cultural and religious influences from settlers, invaders, and neighboring countries. Each chapter is divided into the geography of the area (including a map of the country or countries being discussed), the history, the people and their contributions, and the foods particular to the region. Some chapters are countries discussed individually, others include two or more countries, and several discuss an entire continent. The effort was to choose countries that are culinary representatives of the world. Following this introduction of each country or countries, each chapter contains a glossary of ingredients and dishes as well as a selection of menus and recipes characteristic of the cuisine and its heritage. 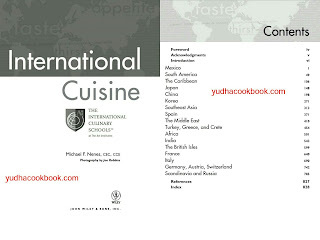 Each menu and recipe in International Cuisine was selected and tested for its representation of the cuisine, to insure a variety of culinary techniques, a variety of ingredients, andavailability of ingredients. However, many of the recipes have been influenced by local customs, ingredient availability, and the inspiration of international chefs, so they have been reformulated to conform to current practices. Methods of preparation are clearly broken down into straightforward steps, and follow a logical progression for completion of the recipe. Here are some important tips for using International Cuisine:ꀌ It is important to understand that to yield a superior dish, you must start with high-quality ingredients. Good results cannot be obtained with substandard ingredients.ꀌ Someingredients are highly specific to a region and may be difficult to obtain elsewhere. The goal was to keep the unusual ingredients to a minimum so that the recipes can be prepared in areas that do not have large ethnic communities. These recipes are followed by Chef Tips, which indicate suitable substitutions.ꀌ All herbs called for in recipes should be fresh unless specified as dried.ꀌ All butter called for in recipes should be unsalted unless specified otherwise.ꀌ It is recommended that the olive oil produced by each country be used for that country’s recipes. For countries that do not produce olive oil but the ingredient is used in its recipes, use a good quality olive oil.ꀌ It is recommended that both white and black pepper be ground fresh to the level of coarseness called for in the recipes. Ground pepper loses strength over time, making it difficult to judge the quantity needed.ꀌ Whencitrus juice is called for in the recipes, it should be squeezed from fresh fruit rather than reconstituted from concentrate.ꀌ Manyof the cooking times indicated in the recipes are approximations. The altitude, type of cookware used, and amount of heat applied are all variables that affect cooking time. Professional cooks use these times as a guide but determine doneness by appropriate means.